I’ve heard so much praise for this series from so many people that I just had to read it. Does it deserve the hype, you ask? Yes, yes it absolutely does. The world building is amazing, beautiful and it’s so detailed that if you close your eyes you can almost see it. This is my first book by the author and I’m so impressed. The amount and variety of creatures that Julie has created in this book is just mind-blowing. There is never a dull moment in the book with nasty, scary characters continuously making an appearance and trying to kill Meghan and gang. I really loved the beginning of the story. Meghan is an average 16 year old girl who is trying to make it through High school, which is honestly, a challenge in itself but then her brother gets kidnapped and replaced by a changeling so she has to obviously go and rescue him and thus begins the journey in the faery world. Meghan is brave and cares about her loved ones. She sacrifices her freedom and safety for her brother’s life and I admire that. But she gets in trouble far too much. I don’t really like the whole damsel in distress act. She is too naive and there were moments when I couldn’t help but roll my eyes at everything that was happening. Puck is amazing. I loved him. He made me smile whenever he was around. He is cute and genuinely cares about Meg. How can she not see that? I think Meg was a little unfair to him. He put his life at risk for her and she just doesn’t give him enough credit. So, yeah I’m Team Puck all the way. I didn’t really have a problem with Ash as a character. He is what he is and I liked him. He has a gentle and sweet side that he tries to hide behind his cold demeanor. It makes sense too because he has gone through something sad and tragic. What I have a problem with is the romance. It happened too quickly. One moment he was mean to her and the next he was making out with her. Not really convincing. At least, not to me. I’ve heard that Ash is more interesting in the successive books. I’m looking forward to that. I really liked the writing, without it the book wouldn’t be what it is. So kudos to Julie Kagawa. Overall I enjoyed the book. I loved Grimalkin. Talking cats, yes it’s been done before but nevertheless it’s still interesting. Pack Rats were just awesome. I want them in a movie, now! I enjoyed the book and I just want to pick up the next one and read on. The things that bothered me weren’t really a big deal, after-all. 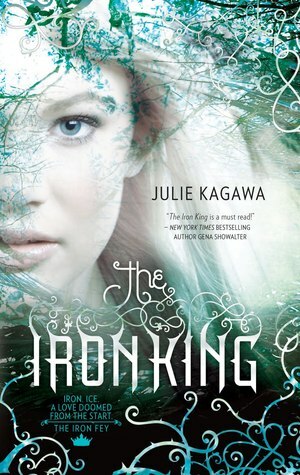 I recommend you to read it just to experience the world that Julie has created. We are doing the manga verison of the IRON KING graphic novel. It is going to make a great addition to the brand. We want your advice too – go to Indiegogo and search for Iron King and see the trailer and character designs!!!! There is only 22 days left for this campaign!!! we are working one on one with Julie. I just emailed your site to my daughter. She is always looking for something to read. I read this book based on a review from someone I know and do not agree with that person at all. I would love to have loved this book, but I thought the author spent a little too much time describing worlds instead of letting you experience them and I hate main characters that are weak, especially weak female characters. She doesn't work/try for anything, she whines and people feel sorry for her so they help her or things just happen to fall into her lap. Found her personality grating.